Nearly four years after the release of The Heroin Diaries and its companion album The Heroin Diaries Soundtrack, Nikki Sixx has penned a new book, and his band Sixx A.M. is back with an album to go along with it--This is Gonna Hurt. 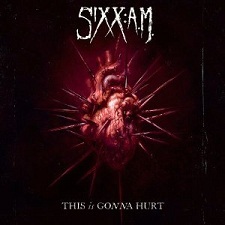 Like the band's previous album, This is Gonna Hurt is autobiographical for the Sixx A.M./Motley Crue bassist, Nikki Sixx. It doesn't retell the same sordid story of his heroin-fuelled excess, however. This album doesn't stick to as much of a storyline as the last either, being more about life during recovery rather than a drug-induced spiral out of control. The album opens with "This is Gonna Hurt", which is definitely well-suited. The title says it all. It plainly illustrates the point that Nikki's path to recovery will not be easy. In fact, it will prove to be painful. Don't think this track is hopeless though. It is actually uplifting--a "call to arms" as the lyrics say--as it is more about reclaiming life in the face of addiction rather than feeling sorry about it. This fist-pumping hard rocker draws the audience into a new phase of Sixx's life, not to mention this new phase of Sixx A.M.'s life as a band. The opening riffs that set off This is Gonna Hurt are as much Motley Crue as they are Avenged Sevenfold. This marriage of an enduring classic sound to the relevance of the modern rock world is present on this song and on the entire album. I love the theatrics presented in the next track, the album's lead single, "Lies of the Beautiful People." The opening lines, "Well this ain't no sideshow / This is the great unknown / This is the poison we take / Yeah..." gets me all stirred up no matter how many times I hear them. When James Michael sings "Yeah..." in his higher register and trails off, it is dramatic and chilling. The heavy guitar riffs from DJ Ashba perfectly complement this song about external beauty being a facade for something more sinister. Though hard rock prevails throughout This is Gonna Hurt, tucked in the middle of this new album are the laid back "Sure Feels Right" and the sweet, sincere ballad "Smile". "Sure Feels Right" paints the picture of driving through L.A. and thinking about that special someone who makes you so happy. This relaxed song has very rhythmic verses, almost like James Michael is talking his way through them--especially when he sings about the highway numbers. The chorus, however, is much smoother, reminiscent of a radio-ready Bon Jovi-esque number from the last decade. This song is quite different from anything I have ever heard from Sixx A.M., but it still struck a nerve with this rocker because I first heard this song while driving to meet the very special someone I recently met. While "Sure Feels Right" is romantic in it's own right, "Smile" is definitely the sweetest song from This is Gonna Hurt. On this track, DJ Ashba slows it down by playing an acoustic guitar, and James Michael sings intensely and emotionally. "Smile" describes a joyous relationship that one seems to wait an entire lifetime for. The lyric "What's an angel like you, ever do with a devil like me?" is a question that often surrounds the romance between a hard living rockstar and his beautiful blonde actress girlfriend or wife. I'm sure that is something Nikki Sixx has encountered more than once. My favourite hard and heavy track from the album is "Deadlihood". Dark, muffled vocals slowly introduce this song which builds into a roaring rocker. These effects give it a bit of a Mudvayne or Breaking Benjamin quality, and I could definitely imagine hearing this song on modern hard rock radio. The chorus is unbelievably catchy, and it would make a great single. Closer to the album's end, "Help is on the Way" gives off more of an alt rock vibe than a metal one, adding to This is Gonna Hurt's diversity. In the intro and verses, a slight distortion of the vocals and the infectious "Dooo oooh oooh oooh" that emanates from the background, reminding me of something by The Killers. This track is one of the most obviously autobiographical for Nikki Sixx. His previous flirtation with death is referenced--"And when I hear the sirens coming / My tempature begins to drop / I'm so unaware / That my heart's about to stop," followed by his newly discovered vulnerability and a need for help. Nikki Sixx may be the leader of this band, and his name certainly stands out to give them credibility, but each member of Sixx A.M. shares songwriting credits. This helps to make each of the songs from This is Gonna Hurt stand out and become unique memorable in some fashion. This band has largely made its mark by writing songs based on Nikki's life, but has done so without sounding like a broken record or coming off as some kind of a gimmick. The autobiographical songs actually accomplish the opposite--they make the songs very real, heartfelt, and sincere. Design the Skyline Debuts With "Nevaeh"